Hunanyan’s is a collection of straightforward poems with threads of religiosity. 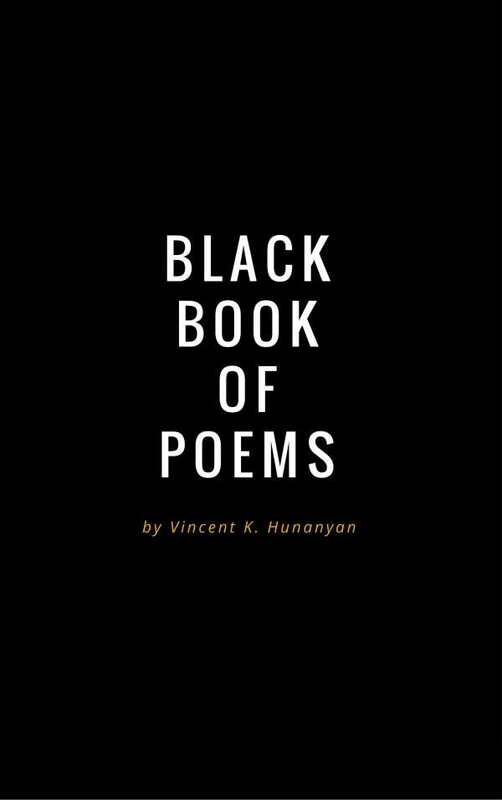 Vincent K. Hunanyan’s Black Book of Poems covers topics of love, devotion, family challenges, and loss, all in a brief space. The collection is presented as one designed to privilege honesty and deny pretension, and its poems are consistent with those values. They are mostly brief and unadorned, and seek in large part to evoke one particular sentiment or feeling. In “If I Were Standing at the Gate,” the speaker imagines himself in heaven, opening the gate for a loved one. It is a declaration of love in the form of a poem, and the feelings expressed are plain and bare. Other poems seem less intent on inspiring visceral responses, and instead put irony to work or offer up criticisms. “Brilliant Mind,” a short poem, imagines what it would be like to be brilliant, but admits, “As of this day, I am at waste, / And still I lack a brilliant mind.” As with other poems in the collection, its message is straightforward: it points out the speaker’s perceived intellectual shortcomings. The poem does this successfully, moving from beginning to end in a straight line. “Blissful Celebration,” another brief but more caustic poem, describes “desolate degenerates of cyber generation” who are “popping pills of preference and other medication” as they sing religious songs of praise. It serves as a vehicle for scorn, pointing out perceived hypocrisy. It states an opinion of a younger generation, and doesn’t quite try to convince anyone that young people are, in fact, hypocrites. Because its purpose is on the humble side, it succeeds. It is one of a number of poems that threads religiosity into the collection. Subject matters are diverse, which allows for the sympathies of the poems to be widely dispersed. One poem depicts a family struggling with poverty; another is an ode to the people of Vietnam; still another laments the loss of children’s lives in the course of a bombing campaign. As different as the individual poems can be, they are stylistically uniform. They are not formal, but they do rhyme. They tend to state their meanings directly. Longer poems put more figurative language and imagery to work than others, but for the most part poems do not distinguish themselves. The collection keeps well within its stylistic comfort zone. At the end of the collection are two brief short stories. “The Sting,” a story in second person, is about a character who is wracked with guilt, and who falls just short of addressing that guilt. “Close Cover Before Striking” depicts a man who has conflicted feelings in the aftermath of his abusive mother’s death. Both stories, like many of the poems, are laden with significance, but don’t quite justify their brevity. They succeed in communicating a feeling, or a note of praise or disdain, but because they are so short, they do not go beyond evocation. Black Book of Poems is a collection with a distinct sensibility that gives attention to a wide range of subjects while living up to its disdain for pretension.